Jesus is the historical figure identified by the many forms of Christian tradition as its point of historical origin and the means of Christian believers' eternal destiny. Jesus of Nazareth was a popular Jewish teacher who reflected the tradition of his day—often associated with the Pharisee group of Jews—adhering to a belief in a future resurrection of the dead associated with a day of judgment and a new form of the kingdom of God. After his death his disciples claimed that he had risen from the dead, a resurrection belief characterizing his disciple group that soon broke away from traditional Judaism to become the earliest Christian Church. This means that the person of Jesus became inextricably bound up with the idea of the conquest of death. Indeed, the novelty of the New Testament does not lie in a general belief in resurrection but in a commitment to the specific belief that it had already taken place in Jesus and, because of that, all who believe in him and are his followers will also be granted a resurrection to eternal life. The significance of Jesus as far as death is concerned does not simply lie in the belief that he was resurrected, but that his death, in and of itself, achieved specific purposes. Here death becomes a symbolic vehicle for a number of ideas, largely grounded in the notions of sacrifice and salvation and traditionally spoken of as theories of atonement explaining how his death beneficially changed the relationship between God and humanity from hostility to reconciliation. The prime meaning given to the death of Jesus both in the New Testament and in subsequent theologies is that it was an act of atonement expressed as a sacrifice. It is important to appreciate the fullness of the extent of this symbolism and the way it has entered into many of the cultures of the world. The death of Jesus could not have been interpreted as a sacrifice without the long historical tradition of the pre-existing Hebrew Bible and the Jewish ritual practices conducted at Jerusalem's temple, especially animal sacrifices for Jerusalem was then a center for animal sacrifice in which the shed blood was the means of removing personal sin. This was a religion in which morality and sacrifice were closely bound together as a means of forgiving the sin engendered by the breaking of divine commandments. The life of the beast was reckoned to be in its blood and it was the ending of that life that made possible the forgiveness of sins. Another important strand of this tradition regarded suffering as the means of atoning for sin as in the image of the suffering servant of God who would be an agent for the deliverance of God's chosen people, Israel. This perspective was developed by some of the rabbis in the early Christian period to argue that death was the most extreme form of suffering, one that was actually experienced by dying individuals who might thereby atone for their sins in and through their own death. The earliest Christian traditions tended to foster these ideas, emphasizing them to varying degree, but seeing in Jesus both the sacrificial lamb of God who takes away the sin of the world and the suffering servant. Much has been made of the fact that Jesus did not die a natural death but died as a criminal by the appointed method of crucifixion. This raises an interesting issue over blood as a medium of sacrifice. Crucifixion as practiced by the Romans, and it was on Roman authority that he was crucified, did not necessarily involve the use of nails and the shedding of blood. Criminals could be tied to crosses and die of asphyxiation when they could no longer bear the weight of their body on their legs. (Indeed, their legs might be broken to ensure this took place.) It was a slow form of punishing death. None of the Gospel stories tell of Jesus being nailed to the cross and John's Gospel has to add the specific, and unusual, comment that a soldier standing by pierced his side with a spear out of which came "blood and water" (John 19:34). This is because John's Gospel has a specific interest in blood as a medium of salvation from sin. In various letters of the New Testament, especially the Letter to the Hebrews, great stress is placed upon Jesus as the High Priest who offers his own blood in a sacrificial ritual (Heb. 9:12); it also echoes the idea of being made perfect through suffering (Heb. 5:8–9). The overall Christian idea is that Jesus and his sacrificial death form the basis for the New Covenant between God and humanity. One aspect of Christ's sacrificial death is reflected in the idea that he was either a representative of or a substitute for believers with the result that his death is related to their ongoing life and, as significant, that their death is no longer just a personal and private event. This is because the language of death, that of Jesus and of the believer, comes to be the means of interpreting one's life and is given fullest formal expression in the language of worship and ethics. Many Christian hymns reflect upon these matters and have ensured that the death of Christ has always remained at the forefront of Christian thought. The piety that sometimes arises in connection with this focus upon Christ's suffering and death has often been profound and is one means of eliciting the responsive love of individuals to God for the love shown to them. For St. Paul, the combined death and resurrection of Jesus takes place at and as the turning point in history between the Jewish religion focused on a single nation and governed by the divine law—Israel's Torah—and the new international community of believers in Christ inspired by the divine revelation of the gospel. This "good news" was that God forgave the sins of all through this sacrificial death and, in the new unified community, created and led by the Spirit of God, there was a new kind of "body" of Christ—the church—existing in the world. The promises and pre-existing history of Israel had now come to fulfillment in this new community of love through God's action against humanity's sin to demonstrate the divine righteousness and to create a righteous world as expressed in different theories of atonement. Early fathers of the church offered variations on the theme of the life and sacrificial death of Jesus within a legal framework, one that viewed relationships in terms of rights, duties, ownership, and obligations. These are sometimes called legal or juridical theories of the atonement. Origen, writing in the third century, saw Christ's death as a form of ransom paid to the devil who had gained certain rights over fallen humanity. At the close of the eleventh century, Anselm, in his famous book Why Did God Become Man?, argued that the death of Jesus was a kind of satisfaction of God's outraged sense of honor caused by human disobedience. Human sin was a kind of debt resulting from the fact that people did not render the honor due to God. Not only ought humanity to return into obedience to God but some satisfaction should also be provided for the outrage perpetrated against the divine. And this was what the voluntary death of Jesus accomplished. His death becomes a satisfaction for the sins of humanity. This view contradicted that earlier theological suggestion that Christ's death was a payment to the devil. One element of Anselm's thought speaks of the death of Jesus as an example of how ordinary humans ought to live by giving voluntary offerings to God. Abelard, a younger contemporary, developed his exemplary theory further arguing that the suffering death of Jesus should so stir the lives of believers that they would respond anew to God. Something of this exemplarist view also stirred the imagination of early-twentieth-century theologians as when Hastings Rashdall (1858–1924) saw God's love revealed in the life and death of Jesus in ways that evoked a human response to a life of service, as published in The Idea of Atonement in Christian Theology (1915). The motive force for hope in most Christian traditions and cultures is, ultimately, grounded in the idea of the resurrection of Jesus and of believers. 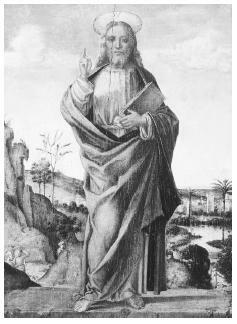 One of the more common images of Jesus is depicted in this late fifteenth century painting by Lazzaro Bastiani . triumphant, as caught in the Latin title Christus Victor, used for the English translation of Aulén's book. This broad tradition expresses the positive accomplishment of Jesus and the sense of confident benefit received by believers through it. In more recent and popular forms this doctrine of the power of Christ over the devil has been used in Pentecostal and Charismatic forms of Christianity in relation to exorcism and gaining power over evil spirits reckoned to be afflicting the sick. The death of Jesus did not, however, simply forge the first Christian groups or give opportunity for abstract theology but became central to three ritual practices: baptism, the Eucharist, and funerals. These ensured that the image of death would be kept firmly before Christian consciousness for the next 2,000 years. Baptism is a rite in which water becomes a symbol expressing several meanings, including (1) the normal function of water to cleanse the body, in this case the cleansing of sin viewed as an impurity or stain to be removed; (2) the biological "waters" associated with birth, in this case symbolizing spiritual birth so that a baptized person can be spoken of as being "born again"; and (3) the image of death, specifically the death of Jesus, for when someone becomes a Christian through baptism he or she is said to "die with Christ." The death and life of Jesus come to be intimately linked in a ritually symbolic way with the death and life of the believer. In this way the historical death of Jesus has come to be invested with deep theological significance and forms the basis for individual believers to reflect upon the meaning of their own lives. In religious terms not only are they said to have died to their old nature and to have been born again with a new nature on the single occasion of their baptism, but they are also called to "die daily" in a spiritual commitment to live a "new life." This emphasis on the transformation from death to life, both in the death of Jesus and in the experience of Christians, is reinforced and developed in a special way in the rite called by a variety of names including the Eucharist, the Mass, the Holy Communion, or the Lord's Supper. In major Christian traditions such as Greek and Russian Orthodoxy, Catholicism, Lutheranism, and Anglicanism, both baptism and the Lord's Supper are regarded as sacraments—special ritual activities in which the outward signs of water, bread, and wine reflect spiritual depths and foster the whole life in the process of salvation. The Eucharist enacts an account of the Last Supper, itself probably a traditional Jewish Passover meal that expressed God's covenant with Israel, held by Jesus with his disciples just before he undergoes the agony of commitment to God's purposes in the Garden of Gethsemane, where he is finally betrayed, arrested, and executed. The Eucharist tells how it was on that night of betrayal that he took a cup of wine and told his disciples that it was his own blood that is shed for them and that they should repeat the act of drinking it as a way of remembering him. And so too with bread that they should eat in memory of his body given for them. Different traditions have developed these themes, some stressing aspects of remembrance as a mental act and talking about wine and bread as simply wine and bread, some even use nonalcoholic wine or even water. Others, especially in the Catholic traditions, speak of the Mass as a "transubstantiation" rite in which the bread and wine "become" the body and blood of Christ through the priest's authority and the proper conducting of the ritual. A major train of thought interprets the Mass as a rite in which the death of Jesus is not simply represented but is also represented. Modern believers enter into the foundational and epoch-making moments in the life and death of Jesus. The familiarity of these rites possibly tend to cloud the significance of what they express and yet when believers take the communion bread and wine they are engaging with symbols of death and life and bring the death and life of Jesus into intimate association with their own lives and death. Not only that, the rite also mentions the death and eternal life of various ancient saints of the church as well as of the more recently dead. Not only do many Christians pray for the dead but also invoke the saints to pray for the living. In other words, the eucharistic rite activates an entire network in which the living and the dead are caught up together within the Kingdom of God. Finally, it is in funeral rites that the death of Jesus has come to play a significant part and these rites have become a major feature of the impact of Christian churches upon many societies. Once more, the death of individual believers is associated with the death of Jesus, their grave is symbolically linked to his and, in turn, his resurrection is proclaimed to be the basis for their future life. Christian burial has come to contain two paradoxical elements reflected in the well-known phrases, "earth to earth, ashes to ashes, dust to dust" and "in the sure and certain hope of the resurrection." These are usually said together, one following immediately after the other, and jointly assert the obvious fact of human decay and the "fact of faith" lodging its hope for the future in the resurrection of Christ. The very existence of baptism, the Eucharist, and funerals reflected and stimulated Christian theological explorations of the death of Jesus as a creative source of life, fostering the view that death may not be a futile end but, in some way, beneficial as in the twentieth century's world wars whose millions of dead have been depicted as not dying in vain but as valiant warriors fighting for the truth. Many war memorials rehearse the saying accorded to Jesus in St. John's Gospel: "Greater love has no man than this, that he lay down his life for his friend." Such memorials often incorporate or take the form of a cross so that part of the conquest of death comes by aligning the death of soldiers with the death of Christ. In many contexts of disaster and catastrophe relatives of the dead often seek some explanation of why the loss occurred and express the hope that something good may come out of it or that some lesson may be learned in order that, as the expression holds, "this may never happen again." To speak of disasters in terms of beneficial death is, in some ways, wrong and might appear insensitive to the bereaved and yet this is how some such events are framed. After Jesus died, the cave-tomb where he had been placed was found to be empty and the body unfound. Disciples say he appeared to them and believed that he had been raised from the dead. The contemporary popular Jewish belief in resurrection came to sharp focus: Resurrection had become personalized in Jesus. The early disciples also reckoned that a spiritual power had transformed them into a strong community, exemplifying the new message of God's love for all, irrespective of social or ethnic background. Identity within the new community of the church involved belief in the triumph over death conferred by this spiritual power coming to believers. From the eighteenth century on scholars used historical analysis of biblical texts to interpret Jesus's life, cutting through centuries of developed dogma. Albert Schweitzer's important works, including The Quest for the Historical Jesus (1906), argue that Jesus believed the world and history were coming to an end and that he was the Messiah whose own suffering would prompt it and help deliver people from the anguish involved. Rudolph Bultmann wanted to demythologize biblical stories so that the Christ of faith could be clearly heard, calling people to decision and faith. In the 1930s Charles Dodd argued for a "realised eschatology," the idea that a degree of divine fulfillment of the Kingdom of God had already occurred in the ministry of Jesus. In the 1950s Reginald Fuller opted for a belief that fulfillment would only come after Jesus's earthly work was completed. Despite detailed research on biblical descriptions of Jesus's suffering and death, much remains open as to whether he felt abandoned by God or not. Similarly, the theme of the resurrection remains contested as an arena in which ideas of the Jesus of history and the Christ of faith remain open-ended as Edward Sanders has indicated. From a psychological viewpoint, some argue that the resurrection is grounded in grief-induced hallucinations. Whatever the case, the death of Jesus has been the major focus by which millions have reflected upon their own death and sought relief when bereaved of those they love. Brown, Raymond E. The Death of the Messiah: From Gethsemane to the Grave: A Commentary on the Passion Narratives in the Four Gospels. New York: Doubleday, 1994. Bultmann, Rudolph. Jesus and the Word. London: Nicholson and Watson, 1935. Dodd, Charles H. The Parables of the Kingdom. London: Nisbet and Co., 1935. Fuller, Reginald H. The Mission and Achievement of Jesus: An Examination of the Presuppositions of New Testament Theology. London: SCM Press, 1954. Kent, Jack A. The Psychological Origins of the Resurrection Myth. London: Open Gate Press, 1999. Sanders, Edward P. The Historical Figure of Jesus. London: Penguin Books, 1993. Schweitzer, Albert. The Quest of the Historical Jesus, edited by John Bowden. 1906. Reprint, Minneapolis: Fortress Press, 2001.